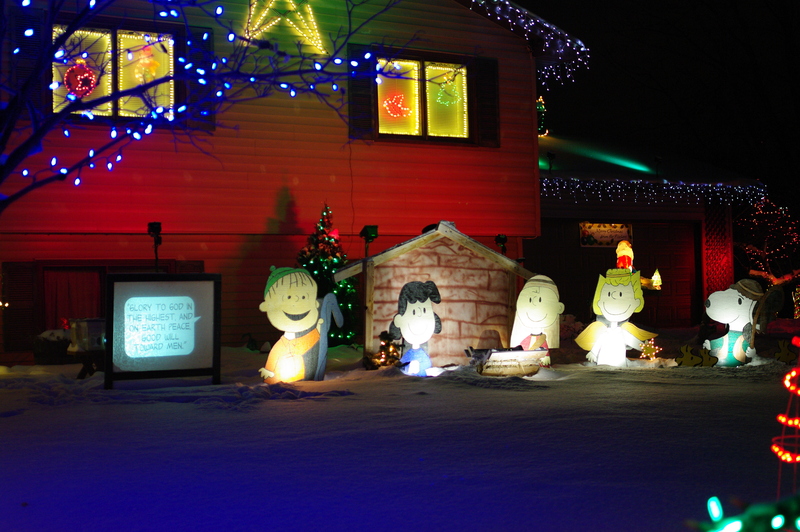 We’ve always felt we needed a Nativity scene as part of our display. If you’ve read the page on the purpose of our display you know that we try to use our display to help spread the real meaning of Christmas. However, we were convinced that we wanted to do something special for the Nativity, not just buy or create any old standard display. In short, we wanted it to something unique– something that would stand out and help visitors focus on this part of our display. The idea hit us one day, why not do a Peanuts nativity scene? We already had Peanuts theming in our display with our Linus Shares the Gospel, which was already religious themed, so the fit seemed perfect. I did some websearching and found that Hallmark had put out a series of ornaments at one time, and this confirmed the idea wasn’t too crazy! 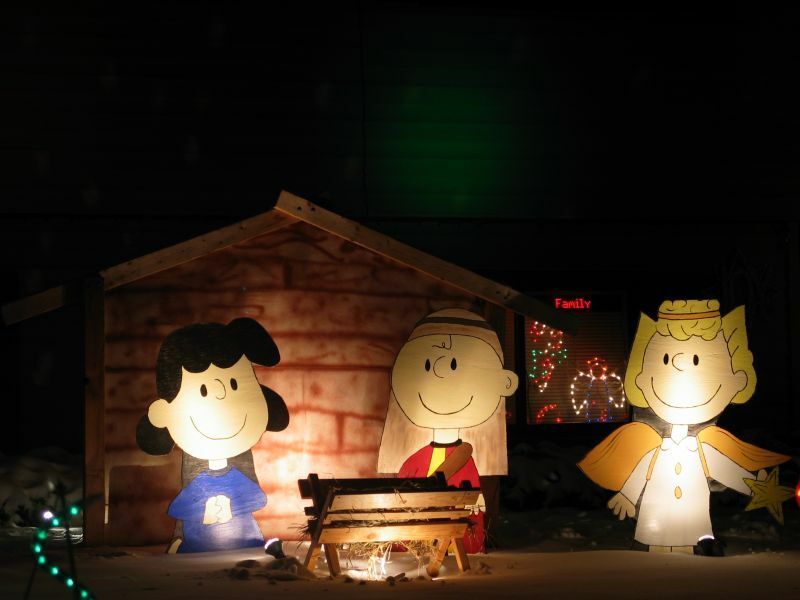 As we did with Linus, the larger figures were home-constructed out of plywood. Cathy drew up artwork loosely based on the Hallmark figures, and we enlarged it onto the plywood, which Cathy did a wonderful job of painting, using acrylics protected by clear polyurethane. 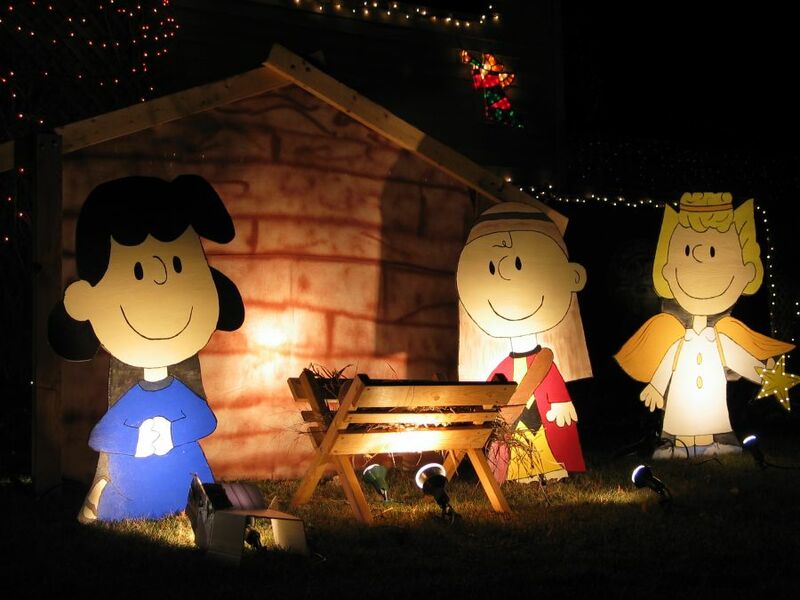 Our Nativity features Charlie Brown as Joseph, Lucy as Mary, Sally as an angel, and Snoopy as a shepherd, with Woodstock and friends as sheep. The original Linus display is now part of the Nativity pageant– he stands next to everyone as the Narrator, giving his gospel message via projected images (originally slides, now video) as he did in his original incarnation. 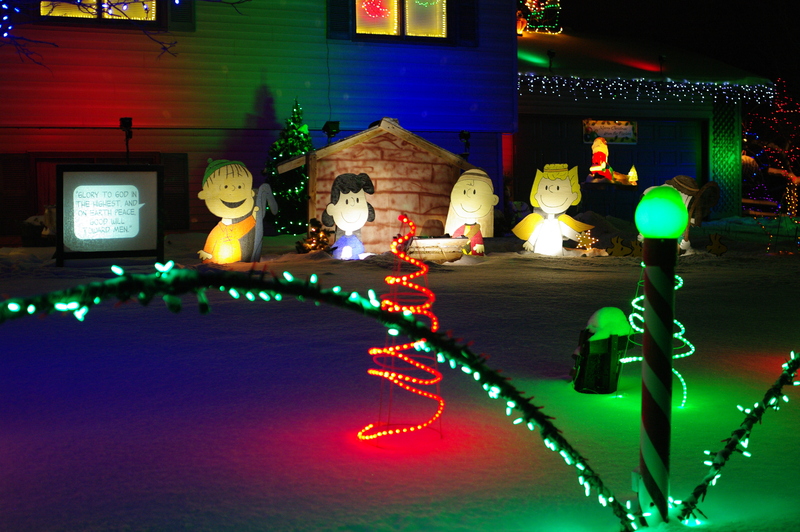 If you haven’t read about the Linus display yet, don’t miss our description of how this display was created, on its own page. Woodstock and friends are not created out of wood, but of corrugated plastic (similar to corrugated cardboard, only plastic). 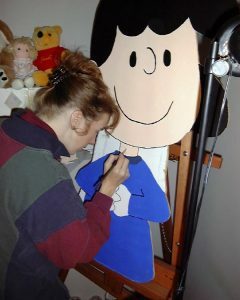 They were cut out, and the plastic sprayed yellow, after which the black markings were added. Corrugated plastic is great stuff to work with, and we also added some custom signs made out if it elsewhere in the display. We built a simple “stable” and manger out of wood to complete the Nativity. The display is spotlighted, and Angel Sally’s star is lit up with some mini lights as well. It was very exciting how all of these ideas came together to make one of the focal points of our display. 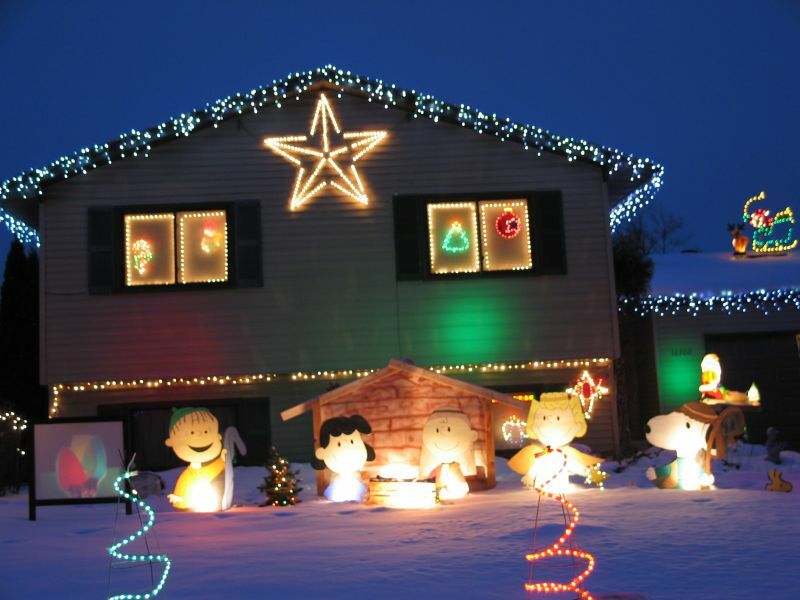 This display definitely helps to spread the Good News of Christmas! For the 2013 season, the seven halogen spotlights (consuming over 300 watts of power) were replaced by new LED versions, using less than 50 watts of power, and giving the display a brighter, whiter look. 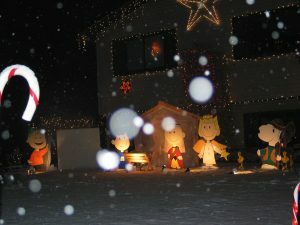 This picture, was taken in a light snowfall back in 2003, the second year of this display.